In the recent extensive literature on European cultural landscapes, much attention is given to regional variation. Less interest seems to be given to history. Ecologists in particular often use the ‘traditional landscapes’ model, which suggests a slow and gradual development of the man-made landscape, leading to a ‘climax’ during the 19th century. In that vision, landscape change sped up around 1900, after which time most landscapes underwent a process of rapid transformation. In this paper, I criticise the distinction between a stable pre-1900 and a dynamic post-1900 history, particularly by emphasising the flawed vision of a stable past. Developments in the past could be—and have often been—quick and intensive. The paper highlights the importance of historical research in landscape studies. The Belgian geographer Marc Antrop (1997: 109) defined the term ‘traditional1 landscapes’ as ‘those landscapes having a distinct and recognisable structure which reflects clear relations between the composing elements and having a significance for natural, cultural or aesthetical values. Traditional landscapes […] refer to these landscapes with a long history, which evolved slowly and where it took centuries to form a characteristic structure reflecting a harmonious integration of abiotic, biotic and cultural elements.’ The slow development is also a key element in the definition of historic landscapes as proposed by Torreggiani et al. (2014: 93): ‘Historic landscapes undergo very slow evolution over time, thus preserving specific characteristics of a given region. On the contrary, the signs and structures of traditional landscapes, which can be referred to a particular time span, underwent substantial alterations after the industrial revolution’. 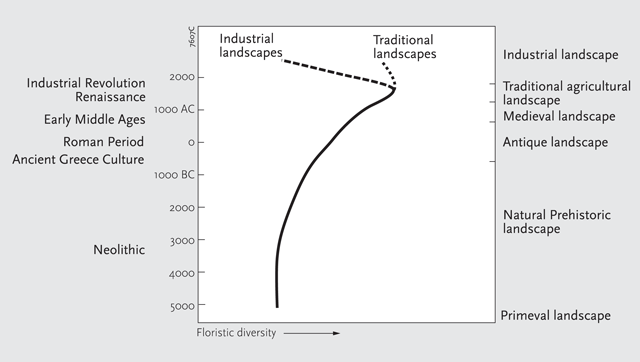 The concept of traditional landscapes (Figure 1) matches a wider tendency in landscape research of distinguishing between a slowly developing pre-modern and a rapidly changing modern landscape and, hence, of regarding the recent period as more dynamic than earlier periods. For historic landscapes that have more or less completely survived the recent dynamics, the German geographer Georg Niemeier (1961) coined the term Agrarlandschaftliche Reliktgebiete. Exactly half a century later, another German geographer, Katalin Solymosi (2011), used a nearly identical concept but preferred the term ‘cultural landscape hotspots’. For the regions in which such landscapes exist, Solymosi specifies three characteristics:  the regions are isolated in a geographical, an economic, an infrastructural, a political or a cultural respect;  they are marginal from an agronomical viewpoint; and  the inhabitants differ ethnically or culturally from the mainstream population. A strong relation is suggested between marginality, isolation and stability. The ‘traditional landscapes’-model. After: Parrachini et al., 2007. The vision of growing dynamics during the twentieth century often carries a heavy, even emotional anti-modernist load. The Dutch ecologist Victor Westhoff (1916–2001) distinguished between the earlier ‘enriching’ and the modern ‘impoverishing’ influence of man (Westhoff and Van Leeuwen, 1959: 107). The English landscape archaeologist Chris Taylor based his ‘zones of destruction’ and ‘zones of preservation’ on the 20th century history of those landscapes (Taylor, 1972; Williamson, 1998). In this vision, landscape protection aims to slow degradation and to protect what remains of the rich pre-1900 landscapes. Although this vision certainly does not capture the entire story, quite a few landscape historians intensely disliked the landscapes of modern industrial society (Muir, 1998), one of the most cited examples being the broadside against the modern landscape in the final pages of W.G. Hoskins’ The making of the English landscape (Hoskins, 1955: 298–299). The slow and gradual development of landscapes also leads to the assumption that landscape structures and field-patterns change only in detail after their initial foundation. This rationale underpins many projects seeking to map historic landscapes, such as the British method of the Historic Landscape Characterisation, which characterises areas according to the period in which the basic layout took shape (Rippon, 2004; for examples elsewhere, see for example Barbera and Cullotta, 2012). In summary, the definitions of traditional landscapes assume that:  the development of landscapes before 1900 (in pre-industrial society) was slow and gradual;  development was even slower in marginal regions; and  since the 19th century, landscapes were transformed. Each of these assumptions is at best a simplification and at worst a complete misunderstanding of the complex histories of landscapes. These assumptions thereby simplify the task of landscape preservation to safeguarding the landscapes that have basically completely survived the twentieth century. This is not merely a gross simplification; it forecloses other possibilities of landscape management. Only by a thorough understanding of the complex histories of landscapes can the management of heritage landscapes advance from the choice between preservation and development into a more sophisticated ‘management of change’. One of the suggested characteristics of traditional landscapes is that they changed only slowly for most of their history. This vision seems particularly popular among ecologists and landscape researchers who focus on the management of cultural landscapes (see for example Calvo-Iglesias et al., 2009; Sancho Comins et al., 1993). However, it can be questioned with overwhelming evidence of the dynamics of landscape development in history (Renes, 2011; Widgren, 2012). The image of slow development in past periods against a highly dynamic present may partly result from historical ‘myopia’, which can be seen as the counterpart of what Lewis and Wigen (1997: 212) called geographical myopia: the idea that one’s own, well-known environment is more varied than distant, less-known regions. Geographical myopia leads to, for example, the opinion that one’s own country is more varied than other countries. The comparable process in time engenders the belief that one’s own period is more dynamic than earlier periods. It was only in the course of the twentieth century that geographers and landscape historians started to realise the dynamics of landscapes in the past. The scientific study of historic settlements and field patterns started in the late nineteenth century with the landmark study by August Meitzen (1895) on types of agrarian settlements. In his study, Meitzen explained these types in terms of ethnic origins and thus located nineteenth-century landscapes close to an early medieval or even Roman origin. His ideas were copied and reworked by H.L. Gray (1915) for the British Isles. In the time of Meitzen and Gray, a strong influence of the natural landscape on human society (‘physical determinism’) was a leading paradigm in geographical research and must also have reinforced the belief in stability. Already during the middle decades of the twentieth century, two developments in the geographical study of landscapes and settlements started to change the ideas of long-term stability in landscapes. The first development was the discovery and study of deserted settlements. From the 1920s, ever more traces of lost medieval settlements were discovered in Central Europe, mainly in forested regions (Simms, 1976). In the British Isles, deserted medieval settlements were thought to be rare, but from the late 1940s, partly based on the large numbers of aerial photographs that became available, they were discovered by the dozens (Hurst, 1986: 200–202). Similar discoveries were made in other countries (Villages désertés, 1965). The study of deserted settlements brought an awareness of rupture in landscapes. Already during the 1930s, the German agricultural historian Wilhelm Abel connected most of the deserted settlements to the late medieval demographic and agrarian crisis (Abel, 1967, 1976). An earlier demographic crisis that led to large-scale abandonments occurred in the late-Roman period. So, within the last two thousand years, two major disruptions interrupted the development of European landscapes. The second development, resulting from intensive use of archival sources, was the growing awareness of the dynamic history of settlements and field patterns. In particular, the sources on land ownership made clear that the heavily subdivided field-patterns of the large open arable fields did not correspond to the original (early) medieval layout but had been developed from much simpler block and strip fields (Krenzlin and Reusch, 1961). Discussion ensued regarding the agents of these changes that revealed that a number of causes were relevant (Krenzlin, 1961): differences in soil and drainage conditions combined with risk spreading and fair divisions certainly played a role, but the most important cause was population growth combined with systems of partible inheritance. The subdivision of fields went hand in hand with the growth of villages that developed from loose groups of farms into densely built Haufendörfer (large, densely built nucleated settlements). However, most of this change was more or less linear: from large blocks and strips to the fragmented subdivided fields that are known from 19th-century cadastral maps. The role of archaeologists was minor during this period. Their research was usually limited to individual sites, and only a few archaeologists were interested in the medieval period. The importance of archaeology for landscape studies grew during the 1970s, when archaeologists started to excavate larger areas and developed an interest in the long-term development of settlements (Kolen, 2005). An additional technique, field-walking (German: Landesaufnahme), extended archaeological research to significantly larger areas and supplied insights into the wider context of settlements and, consequently, led to the discovery of additional lost settlements. On the British Isles, this type of fieldwork happened within the context of a developing interdisciplinary landscape history that again led to a recognition of the dynamics in medieval settlement history. Gradually, it became clear that the early medieval landscape differed markedly from later period landscapes. The post-Roman landscape was characterised by moving farms that were relocated every generation. Only from the ninth and tenth centuries onwards did the locations of farms become fixed, but even in later periods the moving of settlements was less rare than had been previously thought. During the following decades, archaeology turned to new questions and developed from settlement archaeology into landscape archaeology. Large-scale excavations, together with the growing amount of data on deserted settlements, provided new insights into the dynamics of settlement. Settlement desertions were not limited to desertion periods but also occurred in periods of growth and colonisation (Janssen, 1976). They were to be seen as the result of not only decline but, more generally, reorganisations in settlement patterns on different scales. Two case studies illustrate the role of historic research in raising awareness of the dynamics in landscape development. Most classifications of historic European agrarian landscapes distinguish between two main types: visually open and large-scale open-field landscapes and small-scale, enclosed ‘bocage’ landscapes (Bloch, 1966 ; Lebeau, 1969; Smith, 1967; Baas et al., 2012). These two landscapes and their distribution are often regarded as old and stable. For England, the landscape historian Oliver Rackham (1986) distinguished between ‘ancient’ and ‘planned’ countrysides. The first type of countryside refers to an old landscape with field boundaries that date partly from the Iron Age and that gradually developed over the centuries. However, such landscapes have been less old—substantial parts being early-modern and modern (Turner et al., 2006)—and less stable and local than is often assumed. Also in Brittany, the bocage is younger than was believed in prior times: during the fourteenth century, only small parts of the landscape were fenced. From the sixteenth century, the number of hedges and field walls seems to have increased. This increase is connected with the intensification of animal husbandry that itself is linked to the rising demand for animal products from the growing the city of Paris (Antoine, 2002, 2006). Similarly to how much of the ‘ancient countryside’ is not ancient, much of the ‘planned countryside’ is not planned. This countryside resulted from a process of ‘Enclosures’ that changed the containing landscapes fundamentally from landscapes of extensive grain-producing open fields into landscapes of sheep pastures surrounded by hedges. Enclosures were the result of a complex and centuries-long process of change that began gradually and that only in later stages became more strongly planned. The open field landscapes in turn had developed from the ‘long eighth century’ onwards (Hamerow, 2002: 191), when these regions specialised in large-scale grain production. So, the history of these landscapes is quite complex. On the one hand, they belong to what German geographers called the Altsiedelland, the long established agrarian landscapes, yet on the other hand, they were twice turned upside down during the last 1200 years. In recent years, many of these landscapes have been transformed again, when the ever larger scale of arable farming has brought a return of the open landscape. The typical open and enclosed landscapes likely had common origins, with small arable fields and enclosed pastures surrounded by forests and other common lands. Only from the eighth century did they begin to develop differently. In Central England, the Early Modern Enclosures brought the landscapes closer to each other again. During the same period, in Western France, the contrast between the open field landscapes and the bocage grew even stronger and was perhaps largest in the period beginning around 1900 (Widgren, 2012: 107). The history of the hedgerow landscapes is complex and non-linear. The wood-pasture landscapes or savannas of the Iberian peninsula, known as dehesas (Spain; in this article we will use this term) or montados (Portugal), represent another landscape form that is often described as stable and almost timeless. The core region of these landscapes is the Iberian Peninsula, though they can also be found elsewhere in the Mediterranean (Rackham, 1998; Grove and Rackham, 2001: 190) and are related to wood-pastures in temperate Europe. 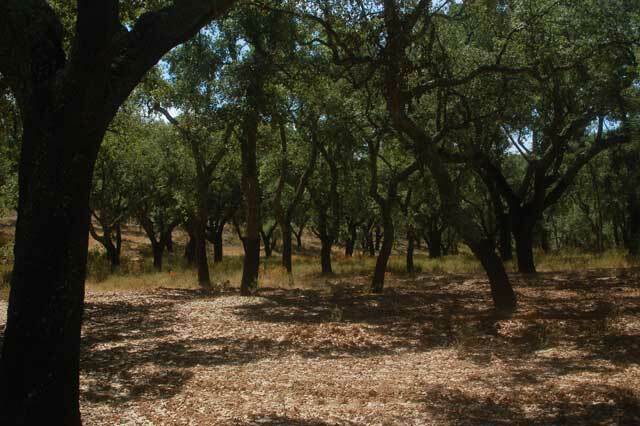 The dehesas are characterised by oaks, mainly holm and cork oaks, combined with arable (grain) and pastures (Figure 2). The pastures are grazed by pigs (feeding on acorns), cattle, sheep and goats, sedentary as well as transhumant. Dehesas constitute a cultural landscape, which resulted from landowners clearing shrublands and planting and pruning trees, thereby turning an older, more extensive land use system (‘monte pardo’) into a dehesa with trees and a relatively intensive pasture-arable rotation (Plieninger, 2004). Montado landscape with cork oaks near Evora (Portugal). Photo by author. The dehesa is described as an old landscape, characterised by ‘remarkable stability […] over 800 years or longer’ (Blondel 2006: 724). One author even informs us that the ‘Iberian Romans reputedly bred pigs under evergreen oaks’, thus implicitly suggesting that this landscape is two thousand years old (Pereira and Pires da Fonseca 2003). The problem with such descriptions is, again, that the landscape is no longer seen as a historical phenomenon. Historical research clarified that the landscape type may be old, but most examples are much younger. The growth of dehesas is, for example, connected to the growth of transhumance from the 13th century onwards (Clément, 2008). However, as dehesas are mainly connected to large estates (latifundios), their development must also have been stimulated by the 19th-century abolishment of the earlier common rights, that made large landowners become complete owners of the land (and adding an aspect of tremendous social inequality to these landscapes) (Plieninger, 2004, 2007; Grove and Rackham, 2001: 207). Literature on the dehesas rarely mentions the external links, but these landscapes depended on the market for their main products such as pig meat, (fighting) bulls, wool, cork and charcoal. Cork was already exported to France and Northern Europe during the 15th century and was used for shoes, roofing and beehives. In the 16th century, it was also used to seal wine bottles. The expanding wine trade must have been a factor in the 18th-century growth of the number of cork oaks. The growth of the dehesas continued during the 19th and the early 20th centuries, and the landscape likely reached its summit only in the middle of the 20th century. Many dehesas likely still have the first generations of oaks, meaning that renewal was never high on the agenda (Plieninger 2004, 2007). Currently, the dehesa-landscapes are under threat, not only by modern agriculture but also by the diminishing demand for some of its products by the recent decline in bull-fighting and the increasing use of metal and plastic crown caps. A ‘traditional landscape’ vision of an old and stable landscape that is now under threat seems to offer a choice between protection and destruction. A more dynamic view, referring to a landscape that has shown remarkable resilience during its complex and dynamic history, may be more inspiring for searching new economic opportunities. As we saw in the definitions in the introduction, the margin is often seen as backward and stable. However, again, the real world is less simple. Not only can marginal regions be extremely dynamic, but the concept of the margin itself is also complex and subject to definitions that are circumstantial and contingent on time and place. Agricultural landscapes are often described as marginal when they are geographically remote (i.e., far from the economic core regions), have poor soils and are only used as arable land in times of population pressure (Bailey, 1989). Implicitly, such regions are often described as poorly connected to the outside world. Indeed, in the past, some isolated regions may have existed that were to a large degree autonomous and self-supporting. However, the assumptions of isolation, autarky and stability are not justified for many peripheral regions (Whyte, 1998: 245). Many regions that we now regard as peripheral were in fact connected to systems of exchange on different scales already during the Early Modern Period or even earlier. Wallerstein (1974) describes regions in the periphery of the emerging world-system as being exploited by the core regions for cheap labour, raw materials, and agricultural products. As a result of this exploitation, their economies are less varied or even one-sided and therefore vulnerable. Small changes in the core regions can lead to rapid and fundamental changes in the periphery. The core regions, by contrast, with their stronger and considerably more varied economies, should be accordingly more resilient and stable. One would hence expect regular transformations instead of stability in peripheral regions. Degrees of marginality can change over time, for example, by reclamation or by the exploitation of resources. During the Middle Ages, many forests and wetlands that were at the margins of the agricultural landscapes were settled and reclaimed. Mining and industry could also give former marginal mountain regions a stronger position in economy and society (Pollard, 1997). During the 18th and 19th centuries, former marginal regions in the British Isles took the lead in the Industrial Revolution and became heavily urbanised (though returned to a more marginal position again in the late 20th century). Changes in relative location also occurred in relation to developments in transport networks. The Orkney Islands are a case in point. During the Early Middle Ages, these islands had a central position in a Scandinavian trading system that included the Northern North Sea and large parts of the North Atlantic. In later periods, however, the islands became ever more part of the European margin. Also, some Mediterranean islands were hubs for shipping transport during the Early Modern Period. During the 19th century, the larger ships and the coming of steamships caused the islands to lose their place as hubs. They also lost their position in the trade in agricultural products, when land transport was improved by railways and, later, motorways (Renes, 2014). The most interesting areas for research into archaeological or historical landscapes are not marginal regions. Most interesting are regions (or towns, or individual sites) that have prospered for a certain period, leading to a large density of relics. When such a period of prosperity is followed by an era of stagnation, many of the relics may be preserved. So, it is not marginality that leads to cultural landscape hotspots, but alternating phases of prosperity and stagnation or of centrality and marginalisation. However, time does not stand still and never did, and the landscape can hardly be described as a ‘traditional landscape’. Rather, it is a landscape that is preserved after—and partly because of—the traumatic experience of a long period of population decline. Until the 1840s, the region was teeming with people, struggling to survive. During the eighteenth century, the population doubled, and a fast process of enclosure pointed to an intensifying agriculture (Aalen, 1993: 89). Everywhere, people were making lazy-beds, small ridges that were dug with spades and that provided a harvest of potatoes. Most families were large and poor and most of the work was done by hand, as the supply of labour was abundant. In addition to—and locally in the place of—the old mixed farming landscape, a landscape of potato-growing developed. It was a landscape of hard work, but the population grew every year. Around 1840, the island of Ireland had eight million inhabitants, as many as England. Of that inhabitant population, 6.5 million people lived in what later became the Republic of Ireland. They were not just subsistence farmers: the west of Ireland was characterised by small family farms that combined subsistence farming with peat-cutting and commercial farming practices (selling young cattle and oats to other parts of Ireland; Aalen et al., 1997: 83–84). Then, in 1840, the potato-harvest failed, and in the following years, a number of famines occurred, particularly in the Western part of the island. The crisis exposed the structural weaknesses of the overpopulated country. Alternative means of employment were rare, and growing numbers of survivors emigrated overseas, to England and the United States in particular (Figure 3). The population of what is currently the Republic of Ireland decreased from 6.5 million before the famine to four million in 1871 and three million in 1926. Only during the 1970s did the population begin to rise again. Currently, the island of Ireland has approximately 6.5 million inhabitants (4.6 million in the Republic and 1.8 million in Northern Ireland).4 England has now more than 50 million inhabitants. 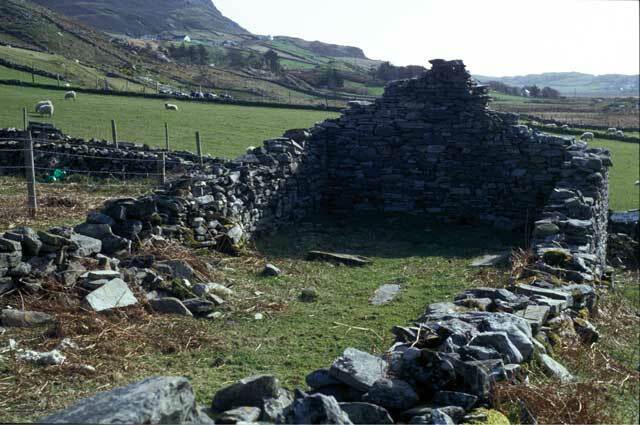 Ruined church in Connemara. Photo by author. Thus, this landscape on the margins of Europe can rarely be called stable. Rather, it is the result of drastic, not to say traumatic, changes in livelihood and population size. Many landscapes have been transformed during the 20th century. In parts of Europe, recent renewal has been extremely fast and intensive. Examples are the collectivisation landscape structures in the former Soviet Union (from the 1920s) and in some of its post-World War II satellites (particularly in the former German Democratic Republic, the Czech Republic, Slovakia, Hungary and Bulgaria). When present geographers map the ‘traditional landscapes’ of Slovakia, they are interested in the few remaining pre-collectivisation landscape structures (Štefunková et al., 2013). However, many historic landscape features and structures have shown remarkable resilience. In some cases, this resilience certainly stems from economic stagnation. As periods of growth often spur changes, periods of stagnation and stability tend towards small-scale adaptation and often preservation. In the initial period of change, many farmers will invest in new buildings and new machines; in a period of stagnation, the same farmer will repair old buildings and machines. Additionally, in marginalised regions, often parts of the population will migrate elsewhere, so the pressure on the land consequently diminishes. But the preservation of a small-scale or a historic landscape can also be a deliberate choice, to make or to keep the region attractive for visitors or to apply for landscape management subsidies. In such cases, regions search for niches in a global economy, and preservation is part of a local or regional response to the forces of globalisation (‘glocalisation’). During the last decades, many such solutions have been subsidised by the European Union: programmes for ‘less-favoured areas’, regional products (‘protected designation of origin’, ‘protected geographical indication’, and ‘traditional specialties’), management grants, and regional funds, among other programmes. For many farmers, such strategies are not connected to marginalised and ‘backward’ regions, but are innovative and creative as well as highly typical of the 21st century. There is yet another aspect that explains part of the continued existence of landscapes with many historic features: namely the capacity of landscape structures to adapt to changing circumstances. There is a tendency among (landscape) architects and planners to think in terms of the principle of ‘form follows function’. In this discourse, changing functions are thought to beget new forms, and the preservation of old structures is deemed anachronistic. During my years as a consultant for the Dutch Ministry of Agriculture, planners and landscape architects tried to convince me that the remaining small-scale agricultural landscapes were unsustainable and would disappear quickly. However, now, three decades later, some of these landscapes survive. It is the planners and landscape architects who have shown a fundamental misunderstanding of the way landscapes develop. The idea of ‘form follows function’, formulated originally by the architect Louis Sullivan (Frampton, 1985: 56), was a program for the future, not a theory based on a historical analysis of change. Throughout the centuries, landscapes have shown a stubbornness to change, incorporating new functions within existing structures. Many new functions of course changed those structures but rarely made them unrecognisable. The result is a landscape that is historic, full of features from older periods. The reuse of old structures, currently recognised as a major task in heritage planning, is not new, but the essential characteristic of landscape history. The complete transformations of landscapes in which older structures were effaced are the exception, not the rule. In recent decades, such fundamental changes were typically connected to state organised planning, such as the post-war collectivisations in Eastern Europe and some fundamentalist land consolidations in Western Europe. In earlier periods, landscapes were sometimes changed completely by enclosures, such as in 19th-century Scandinavia, or by long periods of desertion, but such ruptures were unusual. The Friese Wouden region in the northern part of the Netherlands is exceptional as a landscape in which an extremely dense pattern of wood banks and hedgerows is preserved in a modern agrarian landscape. Around 1900, this landscape was one of a number of small-scale landscapes in the Netherlands, nowadays it is the only surviving example (Barends, 1989). The survival is remarkable in a country having Europe’s most intensive agrarian land use. The history of this landscape is slightly more complex than was generally assumed. In a fenland region, during the High Middle Ages, a field-pattern of long and broad strips was laid out, each strip constituting a farming unit including arable as well as grassland. Field-boundaries were marked by water-filled ditches, used for drainage and simultaneously preventing animals from roaming over arable and neighbouring fields. The farms connected to the strips were located on the main road. Drainage led to subsidence of the peat, and after a few centuries, the underlying geomorphology, consisting of sandy ridges, became visible. On these ridges, the ditches stood dry for part of the year, hence losing their ability to keep cattle out. Here, wood banks (planted with common oak) and rows of alders (De Boer, 2014) were laid out along the field-boundaries. Only in the lowest lying parts of the landscape were the old water-filled ditches kept functioning and the open character of the landscape preserved. Over time, the wood-bank landscape gradually replaced ever more of the open landscape (Brinkkemper et al., 2009). In the open as well as in the enclosed parts of the landscape, the strip-field pattern remained intact. The most remarkable aspect of this landscape is, however, that slow and gradual change continued to the present day (Figure 4). In this region, this change was a deliberate choice by the farmers, who even rejected government plans for a land consolidation project that would have derived the area of its main characteristics. Instead, the farmers have chosen agricultural practices that are—at least within the Dutch context—extensive. Agricultural incomes are supplemented by nature management grants. Two topographical maps of part of the Friese Wouden, showing the remarkable stability of this small-scale landscape. a. The situation circa 1930. The 0 meters above sea-level altitude lines (the bended brown lines) mark the limits of the dispersion of wood banks; in the lower parts of the landscape, water-filled ditches sufficed as cattle fences. (Chromotopographische kaart van Nederland 1:25,000, sheet 76, 1930). © Topografische Dienst Kadaster, Apeldoorn, Netherlands. b. The same area in 2011. 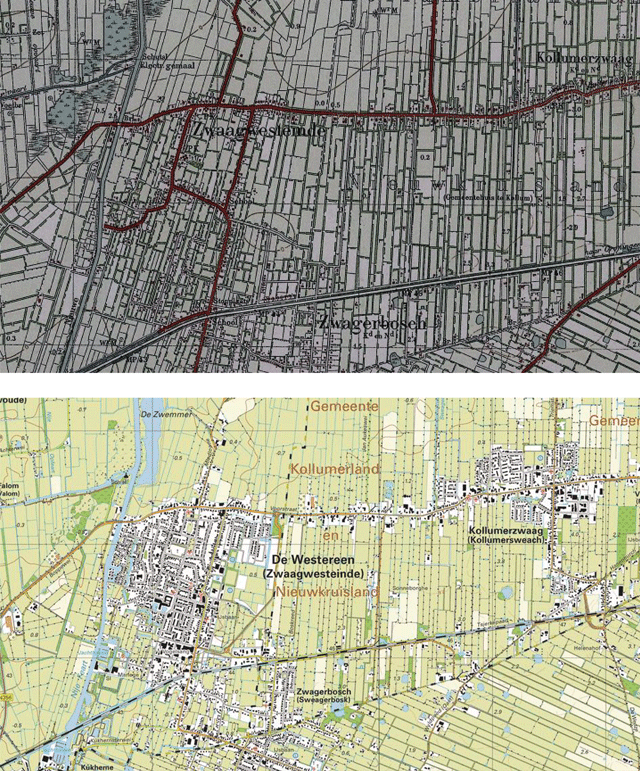 (Topografische kaart van Nederland 1:25,000, sheets 11D and 11G, 2011). © Topografische Dienst Kadaster, Apeldoorn, Netherlands. The opposition between a long and gradual past development and a dynamic present certainly has advantages. It stresses the urge for landscape management while setting clear goals for such management, specifically limiting landscape policies to protecting the landscapes that survived during the twentieth century. However, this viewpoint, regardless of its attractiveness, does not afford an accurate historical account. In theoretical terms, this viewpoint is anti-modernist, opposed to the idea of modernisation itself. In practice, the viewpoint offers little insight into the actual decisions leading to changes and adaptations. Landscapes must be considered dynamic entities, which can never be protected in toto. Landscape preservation means ‘management of change’. For such management of historic landscapes, tools are necessary to decide on the pressure from agriculture, tourism and other forces. A more complete understanding of landscape processes, including past transformations as well as long-term continuity and resilience, is necessary. The examples show that landscapes have never been stable. However, the opposite vision, that landscapes are continuously changing, also lacks nuances. Landscape history shows complex and many-sided histories, indicating periods of relative stability alternating with periods of transformations. Every landscape has a unique history and distinct characteristics. During recent decades, landscape studies have shown a remarkable liveliness. New generations of scientists have entered the field, with new ideas, new questions and new capabilities such as GIS that were unfathomable when my generation entered the field. However, what is often missing is historiographical knowledge, an awareness of the results of earlier generations of scholars. Specifically, the detailed morphogenetic research of the central decades of the last century tends to be forgotten. This forgetting is unfortunate, as the Swedish geographer Mats Widgren espoused when he organised a meeting in 2009 under the heading ‘Lost tracks’. In my opinion, we are not only building on the work of earlier generations. In historic landscape research, the results of those earlier generations of scholars, who conducted fieldwork in landscapes that have now partly disappeared, who worked with sources that are partly lost, and who did intensive archival research that no one ever repeated, remain relevant today. What does this mean for the concept of ‘traditional landscapes’? In my opinion, we should no longer use this term, as it is too polluted by the ideas I have tried to criticise in the present article. A related but more specialised and still useful term is ‘traditional land-use’, which encompasses all ‘practices which have been out of fashion for many years and techniques which are not generally part of modern agriculture’ (Bignal et al., 1996: 63; Plieninger et al., 2006). Examples are extensive grazing, multiple land uses and the use of old animal breeds and plant varieties. The emphasis on activities in the landscape—the anthropologist Tim Ingold (1993) introduced the term ‘taskscapes’—is useful because it stresses the importance of activities rather than patterns and therefore highlights how even landscapes that are at first sight stable are in fact constantly in motion. It also indicates that landscape management is always the work of people. 1The term ‘tradition’ originally refers to immaterial objects (customs, beliefs, practices) that are transmitted from generation to generation. (http://dictionary.reference.com/browse/tradition [19 May 2015]). 2Part of this argument was developed earlier: Renes, 2011, 2014. 3http://www.jmgallagher.net/landscape.html [6 May 2015]. The phrase refers to the Donegal Islands. 4Wikipedia, ‘Irish population analysis’ [22 May 2014]. Aalen, F. (1993). Imprint of the past In: Gillmor, D. ed. Our way of life; heritage, wildlife, countryside, people. Dublin: Wolfhound, pp. 72–107. Aalen, F. H. A., Whelan, K. and Stout, M. eds. (1997). Atlas of the Irish rural landscape. Cork: Cork UP. Abel, W. (1967). Wüstungen in historischer Sicht In: Abel, W. ed. Wüstungen in Deutschland. Frankfurt: DLG, pp. 1–15. (Zeitschrift für Agrargeschichte und Agrarsoziologie, Sonderheft 2). Abel, W. (1976). Die Wüstungen des ausgehenden Mittelalters. Stuttgart: Fischer. (Quellen und Forschungen zur Agrargeschichte 1; 3rd ed; 1st ed. Fischer, Jena, 1943). Antoine, A. (2002). Le paysage de l’historien; archéologie des bocages de l’ouest de la France à l’époque moderne. Rennes: Presses Universitaires de Rennes. Antoine, A. (2006). The ‘bocage’ of the West of France: a landscape built and used by the men. Paper presented at the IEHC, Session 108: Economic history and landscape history. 2006, Helsinki Internet: www.helsinki.fi/iehc2006/papers3/Antoine.pdf [31-5-2008]. Baas, H., Groenewoudt, B., Jungerius, P. and Renes, H. eds. (2012). Tot hier en niet verder; historische wallen in het Nederlandse landschap; de stand van kennis. Amersfoort: RCE. Barends, S. (1989). Percelen in Nederland; veranderingen in de percelering tussen 1900 en nu. Wageningen: Pudoc. (Landschapsstudies 14). Bignal, E. M., McCracken, D. I. and Corrie, H. (1996). Defining European low-intensity farming systems: the nature of farming. Wader Study Group Bulletin 80: 62–68. Bloch, M. (1966). French rural history; an essay on its basic characteristics. Berkeley/Los Angeles: University of California Press. (original French edition 1931). Brinkkemper, O., Brongers, M., Jager, S., Spek, T., Van der Vaart, J. and IJzerman, Y. (2009). De Mieden; een landschap in de Noordelijke Friese Wouden. Utrecht: Matrijs. De Boer, J. J. (2014). Veldgids landschapselementen Noardlike Fryske Wâlden. 2nd ed. Beetsterzwaag: Landschapsbeheer Friesland. Frampton, K. (1985). Modern Architecture; a critical history. London: Thames & Hudson. Gray, H. L. (1915). English field systems. Harvard UP. Grove, A. T. and Rackham, O. (2001). The nature of Mediterranean Europe; an ecological history. New Haven/London: Yale UP. Hamerow, H. (2002). Early medieval settlements; the archaeology of rural communities in north-west Europe 400–900. Oxford: Oxford UP. Hoskins, W. G. (1955). The making of the English landscape. London: Hodder & Stoughton. Hurst, J. G. (1986). The medieval countryside In: Longworth, I. and Cherry, J. eds. Archaeology in Britain since 1945; new directions. London: British Museum, pp. 196–236. Janssen, W. (1976). Some major aspects of Frankish and medieval settlement in the Rhineland In: Sawyer, P. H. ed. Medieval settlement; continuity and change. London: Arnold, pp. 41–60. Kolen, J. (2005). Hoofdlijnen in de Nederlandse landschapsarcheologie (1950–2005) In: van de Dries, M. H. and Willems, W. J. H. eds. Innovatie in de Nederlandse Archeologie; liber amicorum voor Roel W. Brandt. Gouda: SIKB, pp. 101–121. Krenzlin, A. (1961). Die Entwicklung der Gewannflur als Spiegel kulturlandschaftlicher Vorgänge. Berichte zur deutschen Landeskunde 27: 19–36. Krenzlin, A. and Reusch, L. (1961). Die Entstehung der Gewannflur nach Untersuchungen im nördlichen Unterfranken. Frankfurt/Main: Kramer. (Frankfurter Geographische Hefte 35–1). Lebeau, R. (1969, 1986). Les grands types de structures agraires dans le monde. Paris: Masson. Lewis, M. W. and Wigen, K. E. (1997). The myth of continents; a critique of metageography. Berkeley/Los Angeles: University of California Press. Meitzen, A. (1895). Siedlung und Agrarwesen der Westgermanen und Ostgermanen, der Kelten, Römer, Finnen und Slawen. Berlin: Besser, DOI: https://doi.org/10.5962/bhl.title.27211 (3 vols and atlas). Paracchini, M. L., Terres, J.-M., Petersen, J.-E. and Hoogeveen, Y. (2007). High nature value farmland and traditional agricultural landscapes; open opportunities in the development of rural areas In: Pedroli, B. et al. Europe’s living landscapes; essays exploring our identity in the countryside. Wageningen/Zeist: Landscape Europe/KNNV, pp. 21–34. Pereira, P. M. and Pires da Fonseca, M. (2003). Nature vs. nurture: the making of the montado ecosystem. Conservation Ecology 7(3) http://www.consecol.org/vol7/iss3/art7 [May 1st, 2015]. Plieninger, T. (2004). Built to last? The continuity of holm oak (quercus ilex) regeneration in a traditional agroforestry system in Spain In: Konold, W., Reinbolz, A. and Yasui, A. eds. Weidewälder, Wytweiden, Wässerwiesen – traditionelle Kulturlandschaft in Europa, Freiburg: : 5–62. (Culterra; Schriftenreihe des Instituts für Landespflege 39). Plieninger, T. (2007). Constructed and degraded? Origin and development of the Spanish dehesa landscape, with a case study on two municipalities. Die Erde 138: 25–46. Pollard, S. (1997). Marginal Europe; the contribution of the marginal lands since the Middle Ages. Oxford: Clarendon. Rackham, O. (1986). The history of the countryside. London/Melbourne: Dent. Rackham, O. (1998). Savanna in Europe In: Kirby, K. J. and Watkins, C. eds. The ecological history of European forests. Wallingford: CAB, pp. 1–24. Renes, J. (2011). European landscapes; continuity and change In: Roca, Z., Claval, J. and Agnew, J. eds. Landscapes, identities and development. Farnham: Ashgate, pp. 117–136. Rippon, S. (2004). Historic landscape analysis; deciphering the countryside. York: Council for British Archaeology. (Practical Handbooks in Archaeology 16). Smith, C. T. (1967). An historical geography of Western Europe before 1800. London/Harlow: Longmans. (Geographies for Advanced Study). Štefunková, D., Špulerová, J., Dobrovodská, M., Mojses, M. and Petrovič, F. (2013). Traditional agricultural landscapes – a model of detailed land use mapping. Tájökológiai Lapok 11(1): 1–21. Taylor, C. (1972). The study of settlement patterns in pre-Saxon England In: Ucko, P. J., Tringham, R. and Dimbleby, G. W. eds. Man, settlement and urbanism. London: Duckworth, pp. 109–113. Turner, S. ed. (2006). Medieval Devon and Cornwall; shaping an ancient countryside. Macclesfield: Windgather Press. (Landscapes of Britain). Villages désertés et histoire économique XIe-XVIIIe siècle (1965). Ecole Pratique des Hautes Études, VIe section; Centre de Recherches Historiques In: Paris: S.E.V.P.E.N.. (Les Hommes et la Terre 11). Wallerstein, I. (1974). The modern world-system; capitalist agriculture and the origins of the European world-economy in the sixteenth century. London: Academic Press. (Studies in Social Discontinuity). Westhoff, V. and Van Leeuwen, C. G. (1959). De Zwarte adem. De Levende Natuur 62(5–6): 106–114. Whyte, I. D. (1998). Rural Europe since 1500: areas of retardation and tradition In: Butlin, R. A. and Dodgshon, R. A. eds. An historical geography of Europe. Oxford: Clarendon, pp. 243–258. Williamson, T. (1998). Questions of preservation and destruction In: Everson, P. and Williamson, T. eds. The archaeology of landscape; studies presented to Christopher Taylor. Manchester/New York: Manchester UP, pp. 1–24.